Yuri Botnari was born in Chisinau, Moldova (former Republic of the USSR, now an independent state). He studied violin at the National Music School for Gifted Children. At the age 16 Yuri Botnari won his first music award as an instrumentalist. After graduation from the Kishinev Conservatory, he worked with different orchestras as a performer, arranger and composer. In 1982 he became a winner of the regional Young Composers Competition, and made his conducting debut. Later that year he was invited to Leningrad State Orchestra as an arranger and conductor. At the same time, he continued advanced studies in conducting with Professor Ilia Musin at the Leningrad Conservatory. 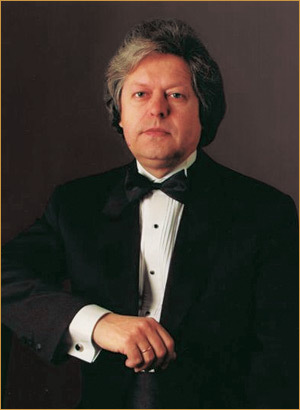 Following his graduation in 1986, he worked as a guest conductor with many orchestras in Russia and Eastern Europe. In 1985, Yuri Botnari took a position of Artistic Director and Chief Conductor at the National Musical Theatre of Moldova. From 1987 to 1992, he was perfecting the art of conducting at the Moscow State Conservatory under Professor Yuri Simonov. He often conducted the orchestra on tours across Russia. In 1991, Yuri Botnari became Music Director and Chief Conductor of EstInd Art Agency (Moscow), where his main task included organizing Musical and Opera Festivals within C.I.S. countries. He conducted at many of these festivals and judged at instrumental competitions. His enthusiasm and financial support made a critical contribution to restoration of Russian Music Society (RMS) in 1995-1996, which inherited best traditions of Imperial Russian Music Society. Yuri Botnari was elected as Vice-President of RMS. In 1995, Yuri Botnari became Principal Conductor of the Moscow Great Hall Symphony of the Moscow State Conservatory, where he organized and conducted numerous concerts. During the concert season of 1997-1998, the Orchestra recorded 8 discs for Italian, Japanese and Romanian companies. In 2003 Yuri Botnari performed on tour with the Moscow Philharmonic Orchestra. His successful collaboration with the Moscow Philharmonic Orchestra continues to this day. Yuri Botnari is a member of the League of American Orchestras since 2001. In 2005 American Biographical Institute awarded him with "Gold Medal for Symphony Conducting" named him as "Great Mind of the 21st Century". In June 2005 he was listed in the Worldwide Honours List of International Biographical Centre (Cambridge, England) for "Outstanding Contribution to Symphony Conducting".